Federal agencies are set to reopen after lawmakers and President Trump reached an agreement to end the partial government shutdown, at least temporarily. Congress quickly passed a three-week stopgap spending measure, which will bring an end to the longest-ever government shutdown, and Trump signed it into law on Friday night. The measure does not include any increased funding for Trump’s proposed wall along the U.S.-Mexico border, which the president had said must be part of any deal to reopen the government. It will fund agencies for three weeks, through Feb. 15. More than 800,000 federal employees are now poised to receive their first paycheck since late December. About 300,000 of those are home on furlough, but Trump recently signed a measure guaranteeing their back pay. As of Friday, the government had racked up a bill of more than $3 billion to pay employees not to work. The breakthrough occurred after repeated attempts by Congress over the last month to pass a stopgap bill were rejected by the White House, and only after agencies have been increasingly crippled by the ongoing appropriations lapse. Those that had survived the opening weeks of the shutdown relatively unscathed were starting to run out of leftover funds, and “excepted” employees being forced to work without pay were increasingly calling out sick or due to financial hardship. On Friday, major airports saw disruptions as large numbers of air traffic controllers refused to come to work. The Senate had not held any votes attempting to reopen government until Thursday, when it rejected both a proposal with wall funding and immigration reforms put forward by Trump and a “clean” continuing resolution. Senate leaders Mitch McConnell, R-Ky., and Chuck Schumer, D-N.Y., subsequently began negotiations for the new CR plan. McConnell called the agreement a "good outcome" reached on a bipartisan plan, though many Democrats noted the Senate voted unanimously for a three-week CR in the week before the shutdown started before Trump voiced his opposition to that plan. "It's a fiscal plan both sides are willing to accept and hopefully we will have good-faith negotiations over the next three weeks to try to resolve our differences over border security," McConnell said. Schumer declared victory on the Senate floor, saying the president had agreed to Democrats' request to end the shutdown and then resume negotiations. Congress will convene a bipartisan, bicameral conference committee on the Homeland Security Department funding bill in an effort to strike a compromise on border security spending. Sen. James Lankford, R-Okla., agreed it would mark an improvement to restart negotiations once federal employees are back at work and getting paid. "Obviously it's very beneficial to be able to have negotiations while everyone is getting paid and everything is still going on," Lankford said. That's much better for federal employees and for the country as a whole." Asked whether the shutdown was a worthwhile endeavor, he added "time will tell" whether both sides actually come together to negotiate. House Speaker Nancy Pelosi, D-Calif., thanked federal employees and said they should never be "held hostage" again. "We value their purpose, we appreciate their diligence in performing their jobs," Pelosi said. "We don't want in any way any shutdown of government to diminish the respect that we have for the purpose of our public employees and the excellence of their service." Some lawmakers expressed consternation with what finally motivated both sides to come together and reopen government, noting that federal employees have been suffering for weeks. Federal agencies will soon begin the laborious process of reopening, which will involve communicating with furloughed employees—banned from using government devices and email—to bring them back to work and addressing backlogs piled up due to missed time. 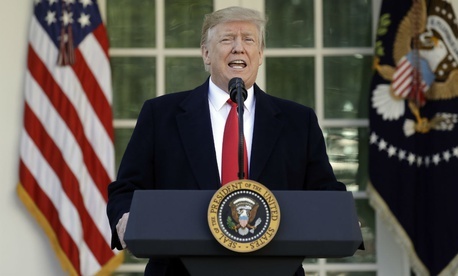 Trump used his address to again pitch the importance of his wall and hinted that he could still declare a national emergency to fund it or even force another government shutdown on Feb. 15 if he felt that was necessary to ensure funding for border security. Pelosi also said she could not guarantee there would not be another shutdown in three weeks. "I can't assure the public on anything the president will do," Pelosi said, "but I do have to say I'm optimistic."